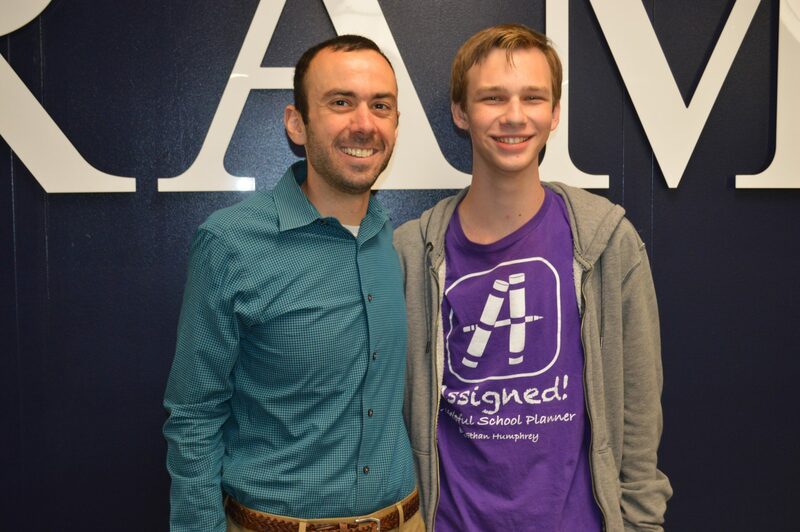 Randolph High School history teacher Michael Lonie congratulates Ethan Humphrey on his APP. When it comes to computer science and technology, Ethan Humphrey of Randolph seems to be a step ahead as he has already patented his first app and mingled with other developers around the world. Ethan Humphrey on his APP. “I was very excited, it was such an honor to be accepted,” says Humphrey, who had submitted his application around Easter and received an email April 20 that he was selected. 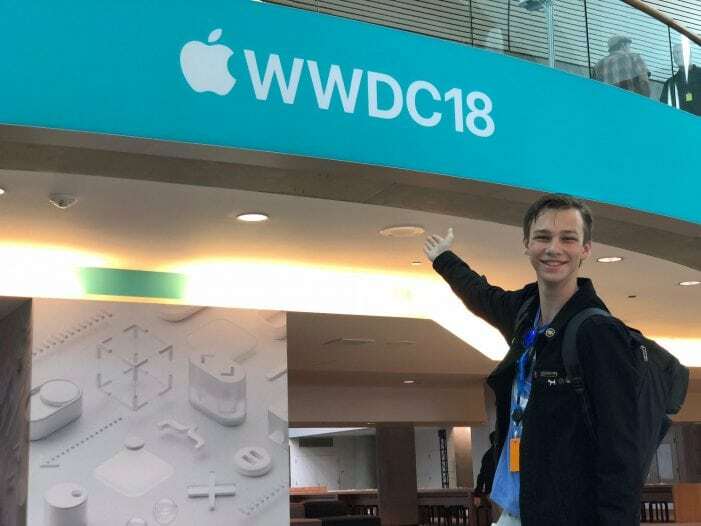 His airplane ticket and lodging at San Jose State University were fully covered by the WWDC sponsors. The purpose of the conference is to learn new technologies, improve current practices, network and meet other developers, explains Humphrey. “Apple devices have been a passion of mine for some time,” says Humphrey, who has been following the WWDC since 2014. “So many developers want to go; you sign up to pay for it” or the selective few, like himself, get to go on scholarship. To get selected, Humphrey had to “create a program to prove your net worth as a developer,” he explains. “They grade your written portion.” The applicants’ assignment is open ended: To make something that demonstrates their knowledge of use of these technologies. 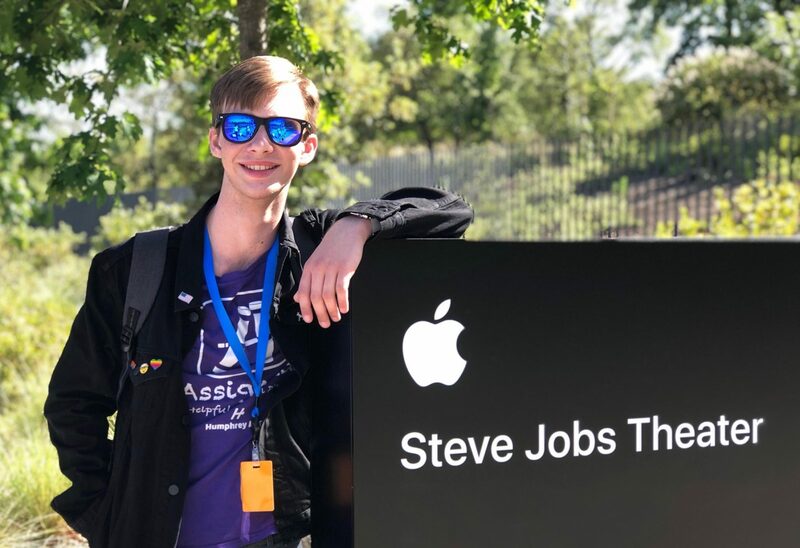 For his application, Humphrey created a game featuring one of the high Apple executives Craig Federighi and took the user through the computer software that Apple made. Ecstatic that he was selected, Humphrey was elated by all that he learned and the connections he made. fellow developers and Apple experts; and compelling presentations. One thrill on the trip was being among the first scholars to be invited to the new Steve Jobs Theater, notes Humphrey. He also enjoyed the speakers on new technologies with demonstrations on how to implement code as well as his discussions with engineers. Humphrey says he was able to attend at least 15 different seminars and labs so he can learn as much as he can from industry experts on the latest on what they are developing. Tim Cook, CEO of Apple was there, and Humphrey met some other developers such as one who works for Groupon and another from Twitter. such as his new App called Assigned! to help students keep track of their assignments. While he attended WWDC, he received some feedback on how he could improve his app. “I took very extensive notes when I went there,” says Humphrey. Ethan said he created the app to help students keep track of assignments and tests. &quot;I have been working on it for two-three years,&quot; he said. He started working on it in 2015 and it took him about 100 hours to design it, he noted. Humphrey first started getting involved in app developing in the seventh grade while living in Bermuda. One of his assignments in his information technology class was to come up with an idea for an app. “That summer I taught myself” how to work on phone apps, says Humphrey. He made Assigned! that summer and when he came back to school in eighth grade he showed his teacher. “She absolutely loved it,” he says. So he talked to the principal about his app and the newspaper. Attention grew and he won second place for the most innovated youth project in Bermuda for teens and young adults at an award ceremony hosted by Digical. While in 8 th grade, in 2016, he expanded his idea, showcased it to all of his friends who downloaded the app and expanded it for all schools. Free to all users, Assigned! was officially published in September 2016 and works for iPhone and Android brands. Its purpose is to keep track of homework, schedules and tests giving students reminders. “I wanted to give power to the students to add homework from any class they have,” says Humphrey. Currently there are 140 monthly users, notes Humphrey, with most in Randolph, some area towns and Bermuda. Humphrey came up with the idea after realizing how difficult it was for students in Bermuda to keep track of their changing two week schedule. Humphrey has made smaller projects and apps before, such as Spendance in October 2016 which tracks how kids spend their allowance, but this is his first big phone app. “Usually during the summer is when I get most of my coding done,” says Humphrey. “I always had an interest in computer science,” he says. He took an online course, iOS for development, learned through sessions on Apple conference or developer documentation and sites like Stack Overflow. “I get my knowledge from a bunch of different sources,” he says, and it may be in his genes. His parents, Scott and Laura Humphrey, both graduated with computer science degrees and met while working for IBM, he says. When he was 10, Humphrey downloaded his own software and started coding on his own. He then took other classes for programming. Looking ahead, Humphrey says would like to study computer science or cyber security possibly at MIT and then pursue a career in app development. Anyone can download the Assigned! App. Visit the App store on the iphone or Google Play on Android. For information on the Assigned! App, visit https://youtu.be/dhQN-_vmh_A; orhttp://onelink.to/jm6cyh.